You need to know a thing or two about nutritional values, or at least what the wording on the food labels means, if you want to make the healthiest, low calorie food choices. Often it is the foods labelled ‘low fat’ or ‘ reduced sugar’ that we need to be careful of; in other words you have to read between the lines. A product that you think will help you lose weight because it is as much as 90 per cent fat free, will still have a very sizeable 10 per cent fat content. It may also have a high sugar content, so will certainly not be low calorie. Also food labels advertising a product as reduced in sugar do not tell the whole story if you are unaware what the original sugar content was. It is important to remember that nutritional values on jars, tins and packages usually refer to a 100 gram serving. If the fat content, therefore, is over 3 per cent, it is not exactly a low fat product. Nutritional values for fluids are usually given for 100ml servings and if they have over 1.5 grams of fat they are not low fat. 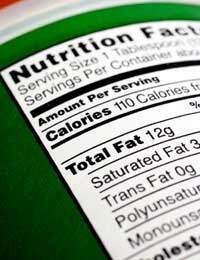 The calorie value of the foods usually appears at the top of the label and there are two figures. The one to take note of is the kcal figure, the common name for calorie. The second figure, kj or kilojoule, is worth about 4.2 calories and is not the measurement we commonly use. It is worth bearing in mind that the recommended average intake of calories daily is 1940 for a woman and 2550 for a man. Ingredients are listed in descending order of their weight, so whatever ingredient the recipe contains most of will come first. The nutritional information gives us the energy (calorie) protein, carbohydrates and fat content. Especially if a food makes a nutritional claim to be a low fat or reduced sugar product, the nutritional information will also contain values on sugars, saturates, fibre, sodium, vitamins and minerals. Any additives in a product are usually listed after the ingredients and appear in categories of flavouring, preservative, antioxidant, emulsifier, stabiliser or colour. If you are interested in the very long list of E numbers for additives, approved for use in European Community countries, you can check them out on a useful Government web-site for the Food Standards Agency, www.food.gov.uk. Antioxidants - which delay or prevent food from turning bad or changing in taste, smell and appearance. Colouring - used to add appetising colour to processed food or to intensify colour. Some are extracts from natural sources and some are man-made. Emulsifier - which helps distribute particles evenly in liquids and prevents mixtures like oil and water from separating into layers. Enriched - some of the nutrients lost in food processing have been put back into the food. Flavouring - there are over 2000, many of them herbs and spices and many man-made. Fortified - extra nutrients that were never present in the original food have been added during processing. For example, breakfast cereals are often fortified with vitamins and minerals. Fructose - a form of sugar found in fruit and honey and often used as a food preservative. Glucose - a form of sugar found in fruit and starches. Lactose - a form of sugar found in milk. Preservative - an additive that helps prevent deterioration until a product’s ‘sell by’ or ‘best before’ date. RDA - the Recommended Daily Amount an adult should consume to prevent any sort of deficiency developing. Labels show the percentage of vitamins and minerals found in a serving, compared to the RDA. Stabiliser - an additive that prevents oil and water from separating and affects the texture and body of foods. Most come from natural sources. Sugar free - the product does not contain sucrose, but may contain other sweeteners such as concentrated fruit juice or honey. No added sugar simply means the product is already sweet enough. Sweeteners - artificial sweeteners have a sweet taste but few, if any, calories. You may consider that all of this presents a strong argument for eating fresh food and home cooked, low calorie recipes as often as possible. Certainly choosing fresh ingredients and cooking them in your own kitchen is the best way to make sure that you and your family are eating healthily and well.